Published on December 4, 2010 in Homebrew. 3 Comments Tags: adjunct, cold, essence, Homebrew, spruce, tips, winter ale. 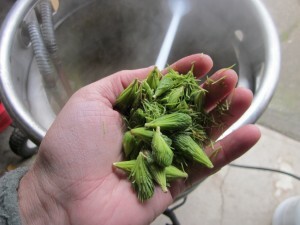 While planning for a holiday brew, I discovered that spruce tips can only be gotten in the spring when the trees are budding. While I read of some folks experiences using old needles (and branches), the result wasn’t something I wanted to shoot for. So I started formulating for a bigger dark winter beer. Then a coworker posted a comment about completing a spruce beer, so I pinged him to see where he’d collected the spruce from. He’d harvested in the spring then frozen it, and he offered what he had left. Score! The following day he showed up with a frozen bag of adorable green buds that had a wonderful citrus aroma. He also shared some tips for brewing with them, such as the decay rate of the pleasant flavors coming from the spruce tips. Anyway, I reformulated my beer and tried to bring the body down to much paler malt profile as to not overwhelm the spruce tips. I also picked up some spruce essence to bolster the fresh tips if needed, as well as two packets of dry Safale, which Steinbarts seems to have marked up significantly from the last time I purchased any. The price increase can’t have had anything to do with a shortage (yeast, exponential growth…), so I think it was just realization that the product is great and (used to) cost $5 less per unit than the liquid yeast. But I’m rambling. Anyway, day of the brew, I mashed in at around 6:30 am, and Alan showed up with some treats for later. My strike temp was on pretty well for a change and we mashed for 45 min @ 156F. After sparging, the kettle had just over 10 gal of wort, and we proceeded with a normal boil until around 10 minutes, at which point we gradually added the bag of spruce tips in over the total of ten minutes until flameout. I also added between 2-3 tablespoons of spruce essence at around 30 minutes hoping that the boil my eradicate the sodium benzoate. On Scott’s advice, I used less than 1/4 what the bottle recommended. The wort actually tastes pretty good. It’s got a nice sprucely flavor, and my samples all had needles in them, but the flavor was clean, citrusy and hopefully, that carries to the final product. Again, thanks to Gabriel for the tips (spruce), Scott for the tips (advice), and Alan for the help and company.